The Legend of Zelda: Breath of the Wild is a fantastic game, as fun to pick apart as it is to master. One tip for those of you who are playing this weekend: Turn off the minimap. As you can see, Normal HUD includes a ton more information than Pro HUD, including temperature, time of day, quest objectives, how much sound you’re making, and a big honkin’ minimap in the corner of the screen. Pro HUD only shows your hearts, though it occasionally conveys other pertinent information as well. Here’s the thing: You don’t actually need to read that extra information as you play. Like a lot of well-designed games, Breath of the Wild consistently communicates with the player in more organic, natural ways. If the temperature is cold enough to be an issue, Link will begin shivering. If you’re not making much noise, you’re not making much noise. The game world itself is easily readable and there’s always at least one easily identifiable point of reference on the horizon. If you want to make sure which way you’re heading, you can look through Link’s scope and any waypoints you’ve placed will illuminate. You can even use the scope to place waypoints. And if you do want to check the temperature or your location, that information is a button-press away in the map screen. With Pro HUD turned on, I found myself much more able to get lost in the world and to play the game in what I’ve come to realize is my favorite way. I forgot about the minimap almost immediately. 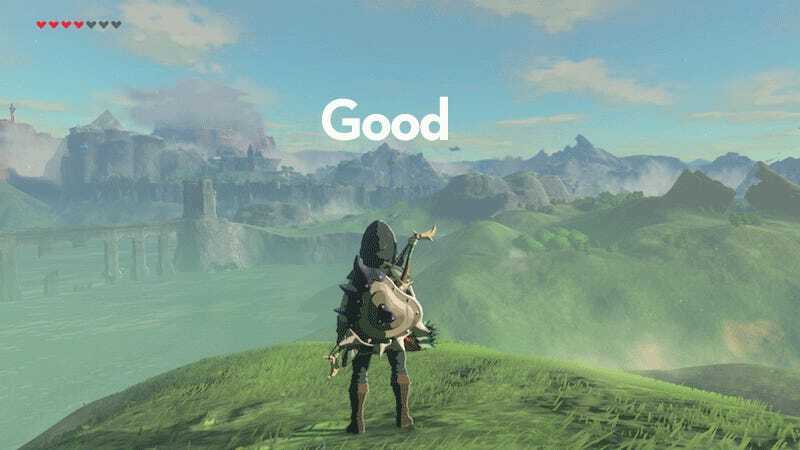 I’ve spent hours and hours in Breath of the Wild simply exploring, wandering around and experimenting and messing about and seeing what’s that over there, and what’s that over there? I actually wouldn’t recommend starting the game in Pro HUD mode. Breath of the Wild has some new ideas that you’re going to want to get your head around in the opening hours, and it’s probably a good idea to have a few assists while you get used to the game. But as soon as you set out from the plateau, try switching to Pro mode. Ditch the minimap and go get lost.